It's been getting more and more popular recently in even foreign countries where people don't use to drink it. Maybe people who adore Japanese food drink it more often. Japanese food is well know it's very healthy and very popular all over the world. But I wonder how many people know amazing benefits of green tea? The other side, it effective in weight loss, skin care and mouthwash. I cannot wirte all of details because it's gonna be too long to read. 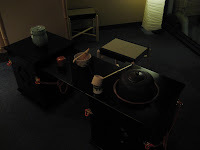 NISHIYAMA RYOKAN　offer complimentary green tea in every room. Some guests asked us if they could get the same green tea we offer. So we began to sell green tea tea back for them to meet its request. 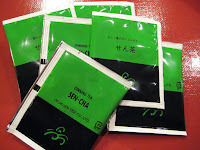 This tea is mixed two types of leaves from Kyoto and Shizuoka where produce the most green tea in Japan. 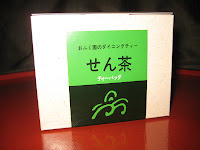 This package contains 16 teabags and the price is 600 yen. If you are interested in it, please feel free to ask at the reception! I've introduced 2 courses and this is the last one. 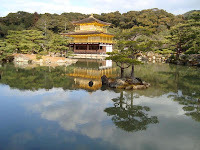 The last one is Northern part of Kyoto including Kinkakuji (Golden Pavilion). Kinkakuji is the most famous and popular place. Almost all guests staying here ask us "how to get to Kinkakuji?" 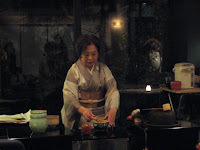 From NISHIYAMA RYOKAN, take Kyoto City Bus #59 or #205. It takes about 30 min. to Kinkakuji. 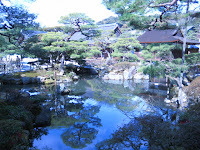 There are two stops which are Kinkakuji-michi and Kikakuji-mae. Please get off at Kinkakuji-michi. It was a sunny day, so reflection in the pond made the temple itself more beautifu! Kinkakuji in snowy day is also something. 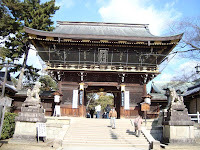 There is another famous temple in this vicinity called Ryuanji. 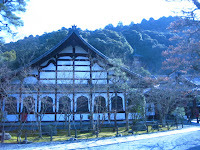 This temple is famous of zen garden. It takes 15min. on foot. If you have one day bus pass, you can also take a bus #59. 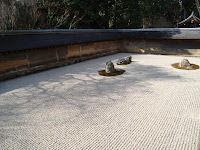 The garden consits of white stones and 15 rocks. It is quite simple but makes people looking at it feel something. This temple is recorded the UNESCO World Heritage Site. 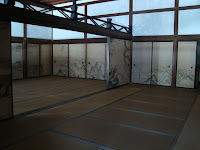 Learn about Ryoanji more through the website below. They have a beautiful website. 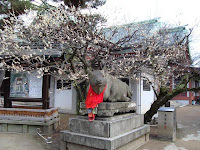 Last destination is Kitanotenmangu shrine. It holds religious service for the god of scholars so that many students visit every year. There is a superstitious. We say people who pets this cow's head become clever. If you visit a shrine and there is a cow, pet its head and get wits. It has a plum garden. 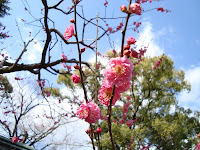 Usually plum blossoms bloom from begging of Feburary. On February 25th, baika festival is held. Now, it is very time to visit there! 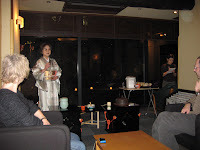 Tea ceremont was held on February 14th. I also joined for the first time. It was great! The teacher spoke English very well and she explained about what green tea made from, what green tea is and how to make green tea. 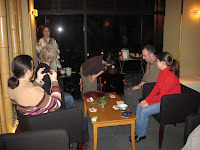 The guests could try to make green tea and of course taste it with sweets. 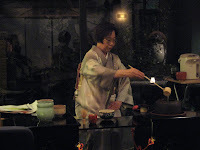 We would like more guests to join this fabulous tea ceremony! This time, I would like to introduce Southern part of Kyoto. 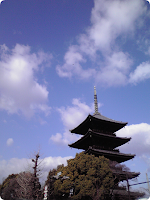 First destination is Toji temple which is very famous as a symbol of Kyoto. To go there, take Kyoto city bus #202 from Saibansyo mae which is infront of Kyoto imperial palace. It takes about 30 minutes. 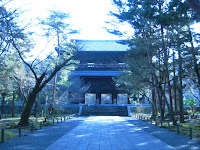 Toji literally means East temple. There use to be a capital city around there and a big gate in this place. Toji was built east side of the gate to protect the city from attack. There used to be West temple as well, but unfortunetely it doesn't exsit anymore. A fire broke out 4 times and Toji was rebuilt 5 times. Interestingly a sprinkler is equipped in it! 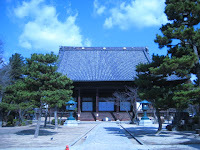 Then, let's go to Tofukuji temple. Catch Kyoto city bus #202 again from Toji untill Tofukuji. It takes about 20 min. from Toji. Tofukuji is the most popular place during the Autumn because of red maples. If you would like to take good pictures, I would recommend you to visit during the winter. You don't get anyone in your cmera's screen. In this meaning, Kyoto during the winter is not bad. 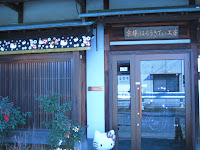 There is a Nishiki food market on your way to NISHIYAMA RYOKAN. If you are getting hungry, descovering some foods may be a good option! They have lots of fresh foods. There are many places to visit in Kyoto. It takes probably few days to see all Kyoto. For people who don't have enough time or have no idea where to go I would like to introduce some half day courses. This course is Western part of Kyoto. Let's start from Nanzenji temple. It takes 15min. by bus from NISHIYAMA RYOKAN. Subway is also convenient from Kyoto shiyakusyo mae st. (Kyoto city hall). 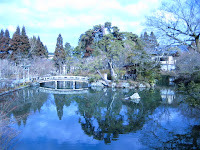 This temple is famous of a biwa lake cannal. 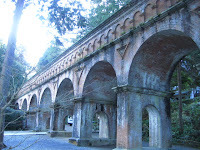 It used to provide water for public and a hydroelectric power from biwa lake in Shiga prefecture next to Kyoto. It was built more than 100 years ago. It isn't used anymore, but Kyoto city preserve as a historical site. Then, let's move to Eikando which is just 7 min. 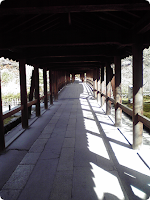 walk from Nanzenji. Eikando is said to be Momiji no Eikando which means Eikando of Japanese maple. Literally red maples are very beautiful during the autumn. 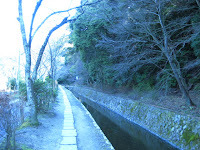 This small pond is also in Eikando temple. It is interesting that there is a kindergarten next to the temple. If you go there in the morning, you may hear cheerful voice. Next, let's walk Tetsugaku no michi (Path of philosophy). It is also very close to Eikando taking 7 min. It is a popular place of cherry blossom. There are cherry trees along the cannal and they look like a tunnel of cherry blossom. Here is highly recommended during the spring. After 45 min. 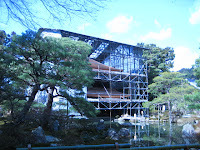 walking, we get to Ginkakuji (Silver pavilion) Unfortunetely, it is been renovating untill March next year. Even though it is underconstruction, it is worth visiting because the moss garden is very nice. If you are Hello Kitty fun, why don't you go to Hello Kitty store? It's about 10 min. walking distance from Silver pavilion. The shop is in a wooden house in a small street. 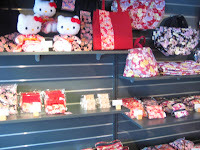 They have a Kyoto's original Kitty products from dolls to bags. Even not kitty lovers, it is fun to look around. Last destination is Chionin temple. It is walking distance or if you are tired, take a #17 bus and get off at Kyoto Kyodai nougakubu mae or Hyakumanben. From there take #17 bus at Hyakumanben st. and get off at Kyoto shiyakusyo st. (kyoto city hall). It takes 10 min. then you can come back to NISHIYAMA RYOKAN. If you don't want to be hurry, it is not necessary to go all places. Pick up the place depending on your plan or what to want to do. Tea ceremony is going to be held soon. We invite the teacher and offer you authentic rich green tea. If you are planning to visit Kyoto, please feel free to join us. Reservation for tea ceremony is NOT required. We look forward to meeting you at the lobby!